Stunning violet purple leaves and pink flowers makes this variety perfect for flower beds and pots. The licorice taste is wonderful paired with tomatoes, and it colors and flavors homemade vinegars. A member of the mint family, basil is great as an herbal tea for stomach complaints. Pinch often, mulch, grow in organic, well-drained soils. A sweet basil with a light anise and clove flavor, delicious for fresh use in green and tomato salads. A prolific producer of large leaves. Try cutting and placing in a glass of water on the kitchen windowsill for several days of fresh-cut taste. Cultivated for eons, it is a sacred herb in its native India. 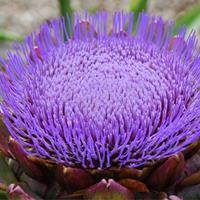 Thrives in organic, moist, yet well-drained soils and warm summer temperatures. Harvest before flower buds form, or pinch off buds to extend harvest time. Sow twice a season for fresh tender leaves all summer. In Hindu mythology, sacred basil is an incarnation of the goddess Tulsi, offering divine protection. Important in Ayurvedic medicine, used for colds and flu and a powerful adaptogen for counteracting stress. It is a beautiful mounded plant with narrow light green leaves and small lavender flowers blooming on small spikes that attract bees. A wonderful soothing tea is made from the leaves, fresh or dry. Sweet liquorice flavor perfect for Thai cuisine! Baby beet leaves are delicious added to salads, or allowed to develop into candy-striped beet roots. The maroon leaf color develops a rich lustre as summer unfolds. Beautiful paired with nasturtiums and calendula in the blended garden; pick the blossoms of these amiable companions to add to salads! Resow throughout the season at 2-3 week intervals for a continuous supply of tasty leaves. Italian Heirloom, improved strain pink and white candy stripe roots, light red skin. Leaves all green, stems stripe pink exceptional sweetness; loses quality when large. Original in a Venetian hill town with this name; cult. In US since 1840’s. These sky blue starry flowers with a subtle cucumber flavor dress up summer salads punches and tea. Historic use to "gladden the heart." This product is not compliant with the United-States-Canada Organic Equivalence Arrangement (USCOEA) and is not certified organic in Canada. We chose oats as our favorite cat grass, for it has healing and soothing properties, perfect for kitties craving greens. It keeps them away from possibly toxic houseplants while adding minerals and breath cleansing chlorophyll to their diet. Easy and fast to grow, in about a week you will have a fresh crop for kitty! Organic oats. Ready for cats to eat at 2-4" growth. A pretty-as-can-be chard, 'Pink Passion' is tasty at baby stage in 28 days, and drop-dead gorgeous full grown, with bright pink wide stems and succulent deep emerald leaves veined in pink. Glossy, puckered leaves in colors of green with yellow, orange and white stems, and purple with red stems. 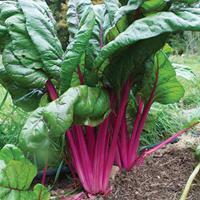 A decorative and delicious chard that produces continuously from late spring to fall freezes. Pick the leaves to harvest, selecting from each plant, or renew an older planting by cutting to 5" tall. Provide fertile, organic soils that are well-drained. Heavy yields. A mainstay of Mexican comfort food. 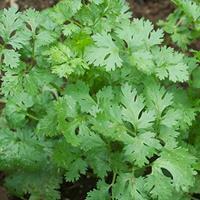 This cilantro variety has great flavor and abundant large, fresh leaves, and bears over a long time.